Figure 1. * Because an incentive, law, or regulation may apply to more than one technology type, adding the totals results in counting some items more than once. Over the last year, state legislatures and agencies have been busy creating incentives, laws, and regulations that support the use of alternative fuels, advanced vehicles, and other strategies that align with Clean Cities' mission to advance alternative fuels and energy-efficient vehicle technologies. In 2013, states established 25 new incentives related to alternative transportation. This is considerably more than the 11 incentives established in 2012, a sign that state budgets may be rebounding and states are giving additional consideration to alternative fuels and advanced vehicle technologies. Figure 1 shows a breakdown of incentives established by fuel and technology type. The largest numbers of incentives were related to natural gas vehicles (NGVs) and natural gas infrastructure development. For more information, see the previous technology bulletin on this topic. 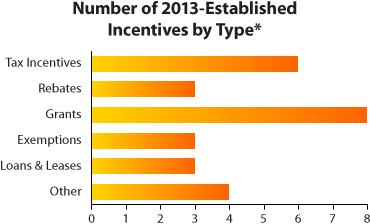 The most common types of incentives were grants, and several states initiated funding programs for biofuels via grants. For example, Illinois and Minnesota introduced ethanol infrastructure grants, and Kentucky began offering grants for biofuel production for use in farm equipment. New tax incentives include infrastructure tax credits in New York and vehicle tax credits in Indiana (Figure 2). Figure 2. * Because an incentive may apply to more than one category, adding the totals results in counting some items more than once. Private entities and utilities implemented seven new incentives in 2013, most of which apply to customers in specific areas or utility service territories. These incentives add to the 16 similar incentives established in 2012, but several of those expired or lapsed. Figure 1 demonstrates the majority of the public/utility incentives were related to electric vehicle supply equipment (EVSE) and plug-in electric vehicles (PEVs), specifically grants and rebates, including the Central Maine Power grant program and the Glendale Water and Power EVSE rebate in California. 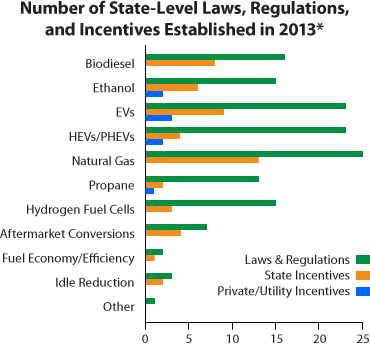 In 2013, state governments enacted 54 new laws and regulations related to alternative fuels and advanced vehicles, as compared to 36 newly enacted laws and regulations in 2012. 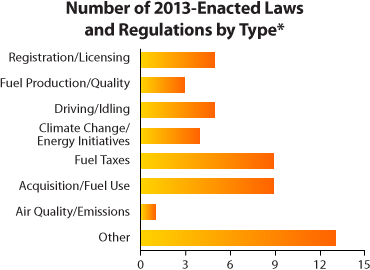 The most common subject matter for these laws and regulations included fuel taxes, and acquisition and fuel use (Figure 3). Figure 1 outlines the breakdown of these actions by fuel and technology type. Approximately 25 regulations and laws were related to natural gas, including states that redefined the way natural gas vehicle fuel is taxed, such as Florida, and states that implemented requirements for NGV safety, such as Texas. Figure 3. * Because a law or regulation may apply to more than one type, adding the totals results in counting some items more than once. Several states are staying ahead of the curve in implementing new policies and procedures that address PEVs and EVSE. For more information, see the previous technology bulletin on this topic. Eight states, including Massachusetts, signed a memorandum of understanding to support the deployment of zero emission vehicles (ZEVs) through involvement in a ZEV Program Implementation Task Force. States are also responding to the potential for an increase in biofuels in the fuel supply, due to the federal Renewable Fuel Standard. For example, in Maine it is now illegal to offer, sell, or distribute gasoline that contains ethanol at a level greater than 10% (E10).